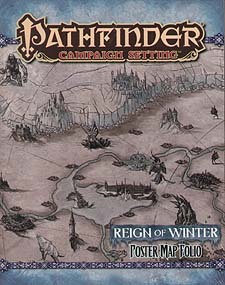 Enter the frigid northern lands of the Pathfinder campaign setting with the Reign of Winter Poster Map Folio. Seek high adventure while battling nefarious rulers of the north or map your party's explorations through mysterious regions of the Inner Sea and beyond on three giant poster maps designed for use with the Reign of Winter Adventure Path. Huge poster maps depict the city of Whitethrone - capital of the frozen realm of Irrisen - and the rough wilderness region of Iobaria. The third map is a giant player-oriented map of Irrisen designed to look like a ink-and-parchment drawing of the region, complete with sketches of local threats and legendary winter creatures! Whether you're looking for a wintry city or a mysterious regional map for inspiration and adventures, these beautiful maps are the perfect resource for the Reign of Winter Adventure Path or any fantasy campaign.